WinWin Signals is a new binary options product being brought to our attention by Monica Stevens. Monica claims that her application is the best forecasting system of 2015 and that is proven to make over $1400 per day. I think someone should tell her that it’s actually the year 2016. A pretty large mistake considering it’s the first sentence on the top of the webpage. Today I’ll be providing review and letting you know if Monica truly holds the key to our success with her new signal system. 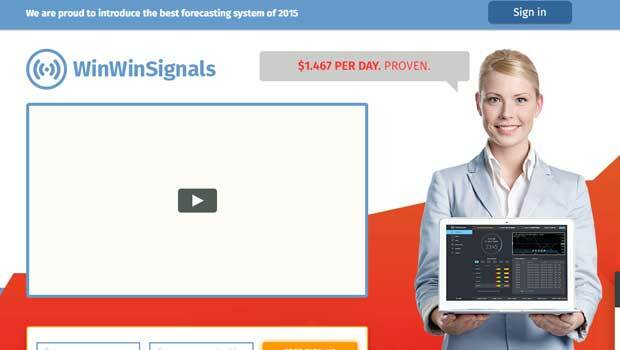 Like many of the binary options products we see WinWin Signals claims to be another beta test. I’ve warned traders about beta tests hundreds of times in the past. The problem with the beta test is that it’s the part of the process where developer works out issues with their system. Thus, if you take part in any sort of beta test there is a very high likelihood that minor errors can cost you your entire account. Monica’s story doesn’t really give me much confidence either. She tells us that she was a public relations manager for candy crush in the movie Wall Street 2 while simultaneously being employed by CitiBank. I don’t see how this makes her qualified to release WinWin Signals in a market where she has no experience whatsoever. Monica also lies to us aggressively on her sales page. There are a bunch of images on the website that lead us to believe that there have been news articles written about this product and Monica by major news publications. Yet, if you go to any of these websites, Bloomberg, Business Insider or Forbes and do a simple search you will find nothing about the WinWin Signals system. It’s my belief that Monica created these fake images to make or product look more important than it really is. I cannot recommend a developer that has no experience in the binary options market that is trying to fool us every step of the way. I will not be using WinWin Signals and I suggest the binary today members follow in my footsteps on this one. Please let me know what you think about this signal service by leaving a comment below the article now. As always, you can click ask John at the top of the page if you want to ask me a question or send me a personal email. I always get back to my readers and understand that I do this for them. Thanks for coming to binary today and please let’s get our week started on the right foot.